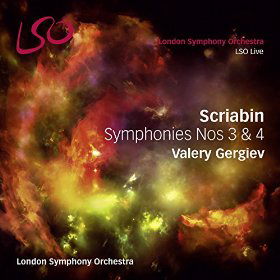 Much of the music of Alexander Scriabin (1872-1915) has been recorded and performed this year to acknowledge the 100th year anniversary of his death and this new live London Symphony Orchestra recording offers his 3rd and 4th symphonies written during the time frame when Alexander had become interested in mystical and occult ideas which had a direct influence upon his music. Scriabin and Rachmaninov were born a year apart and for a time were linked together as both attended the Moscow Conservatory and both were concert pianists with some of the same teachers. However, while Scriabin was convivial and elegant Rachmaninov was taciturn and stoic. Scriabin tried to take music to a new level combining religion, arts, and color. Scriabin had chromesthesia, the ability to sense colors in musical notes. Rachmaninov followed in the footsteps of Tchaikovsky but his colors were traditional. Both were successful but in diverse directions. Symphony No. 3 (“The Divine Poem”), op. 43 was written between 1902-1904 at a time in his life when ideas of the occult and mystical ideas began to absorb his life. The opening movement offers two themes which you’ll hear throughout the three movements. The movement is filled with feeling and strong emotion depicting human life with its trials and tribulations. The second movement titled “Delights” uses the theme from the first movement but this time Scriabin focuses on the use of individual solos within the orchestra which brings out the heart felt emotion. One can hear the chirping of birds in the springtime in this overall tranquil movement. The third movement “Divine Play” also uses the themes that you heard in the first movement only this time it seems that Scriabin goes all out in the ultimate grandiose manner attempting to bring out the maximum amount of feeling blended with a bit of humor. Symphony No.4 (“The Poem of Ecstasy”), op. 54 was written in 1908 but Alexander was already thinking about it before he had completed his third. By now Scriabin had been completely absorbed in as he states”… An ocean of cosmic love encloses the world and in the the intoxicated waves of this ocean is bliss…” The opening melody with the solo trumpet offering the melody is quite reminiscent of parts of The Planets from Holst. One can also hear the strains of Debussy in some of the quieter moments. Scriabin appears to have broken this 20 minutes down and written the material in cells that somehow end up being quite cohesive when the work ends. Having heard these works before the thing that sticks out in my mind most is the superb recording job done by the people at Classic Sound Ltd. This is a live recording but one can’t hear that to be the case. If you have multi channel 5.1 it will sound even better as these works from Scriabin are large grandeur pieces lend themselves to multi channel systems. This CD is nicely conducted by Valery Gergiev and would be a good choice if one wishes to have this in your collection.